First of all, i want to congratulate Mr. Azrael Coladilla for being featured yesterday at Manila Bulletin's Tech News. Lace Llanora was mentioned (yippee!) in passing (nyeh). it is a nice buy but you cannot play it in normal sequence, it shuffles the mp3 files but as what my boss said, pre-programmed random since it is the same randomed sequence every time you turn it on. moving on, i want to purchase these gadgets soon! when i have money and the certainty that i wont lose my job. haha. these are form nextbase, they are selling theseportable dvds in tablet form and like that on the left, dunno what it is called. this one costs 10k in SM appliance store. a nifty gadget to go with this is the wireless headphones! i was thinking cd-r king must have these, but azrael said they dont have it yet. anyway, next base is selling these wireless headphones to go with the portable dvd player. see this on the right. then i read the newspapers today and discovered that Sony and JVC have portable dvds already. i just don't know the price yet but it's exciting to get to know more about them. 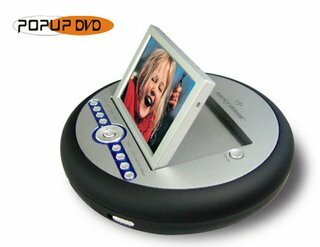 i wish i have these dvd players!!! so i can watch any dvd when im bored waiting for the car or azrael.